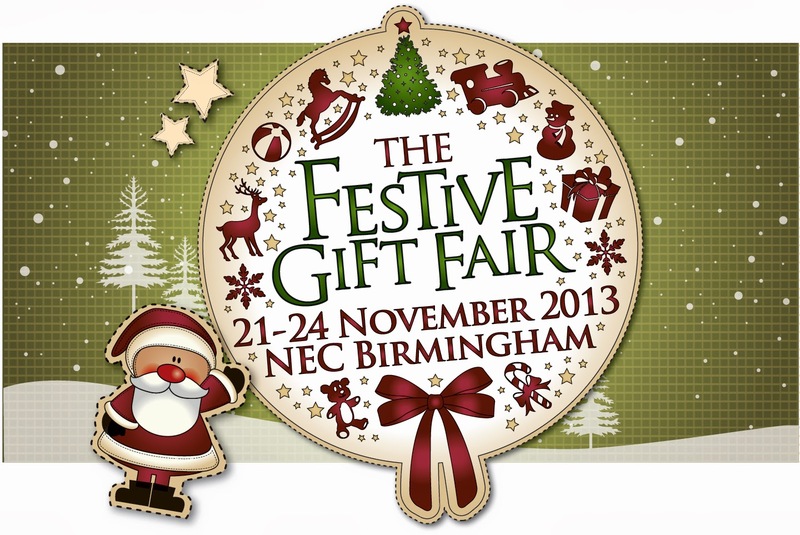 On Sunday we headed to the NEC Birmingham for a family day out at the Festive Gift Fair. 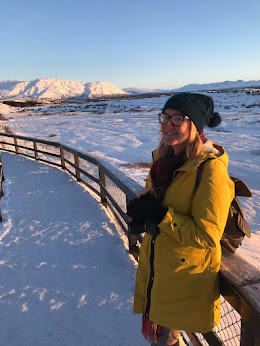 I was very excited to go and find some nice quirky gifts for friends and family as well as some christmas treats for ourselves. We arrived around midday ready to do some shopping and I have to say it was a lot busier than I thought it would be! It was quite overwhelming and there was definitely not enough room to get around smoothly with a pushchair. 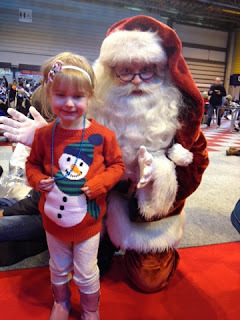 I could see I wasn't the only one with this problem and many people were lacking christmas cheer, tutting and frowning at anyone trying to get through the crowds with pushchairs or wheelchairs. We made the most of it though and tried to get a look in at as many stalls as possible. Once I started to look at stalls my plans of what I was looking for soon went out the window and what I actually bought were not items I expected to find. 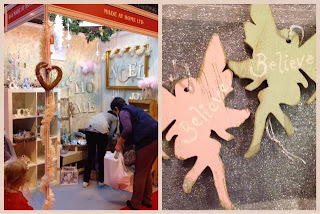 One of the first stalls I came across that really made me stop was called Made at Home (pictured below left) they had lots of lovely handmade items for the home and we bought these lovely fairy decorations (pictured below right). I actually only bought one to begin with but went back right at the end to buy another and take a quick photo. I am actually a bit gutted that I can't seem to find a website/facebook/twitter page for this company so would love it if anyone could help if you know how I can find them?! The next stall that I was really impressed with was called (GARDENS2YOU.CO.UK) among many lovely ornaments I spotted a beautiful toadstool ornament that immediately caught my eye. As many of you may know I am currently decorating Gracie's bedroom in a fairy wonderland theme so I couldn't not buy one of these. 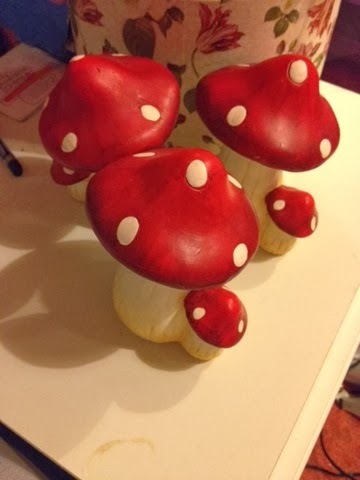 They were actually just £2 each or three for £5 so I bought three and can't wait to put them in her room. These were definitely my best buy! I also bought a huge Father Christmas decoration for my front room after seeing so many people walking around with them. I didn't catch the name of the stall as it was so busy that I didn't get a good look inside. My only other purchase of the day was some different flavoured fudge from one of the many fudge stalls, I have a huge sweet tooth so was very happy to see so many lovely sweet stalls. There were lots of great stalls there selling lots of unique products. Many were too busy for me to get a very good look at what they had to offer. I saw a lovely stall selling the most beautiful string fairy lights I have ever seen that I really wanted to buy but couldn't get close enough to choose any. I also noticed that there were lots of stands giving out samples of different alcohol which at one point I would have loved but wouldn't be advisable for a mum who isn't used to having a drink so I had to steer clear! Gracie was very excited to bump into Father Christmas himself at the Festive Gift Fair! The guy was lovely and stopped to talk to her and have a photo taken. She was too shy to smile properly though and wouldn't stop still hence the awful quality photo! I was a little bit disappointed there wasn't more to entertain kids there though it would have been great if they considered adding a Santa's Grotto or christmas craft area in future as being bumped around by busy crowds is a bit too much for young children and so we only spent a couple of hours there before calling it a day as Gracie got upset which was a shame. Overall we had an enjoyable day but I think in future we would either leave the kids behind or go on a weekday and hope it's a bit less busy. I definitely think it is a great place to shop for unique christmas gifts for family and friends or even just some nice home interior products. 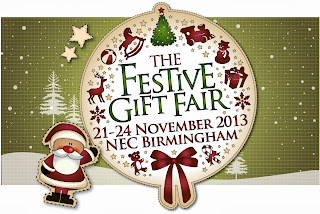 It is a great way to start the festive season anyway so I will definitely go again next year one way or another! We received complimentary tickets to the show for the purpose of this review. All opinions are my own.